Square Corner Hinge, 3.5" x 3.5". 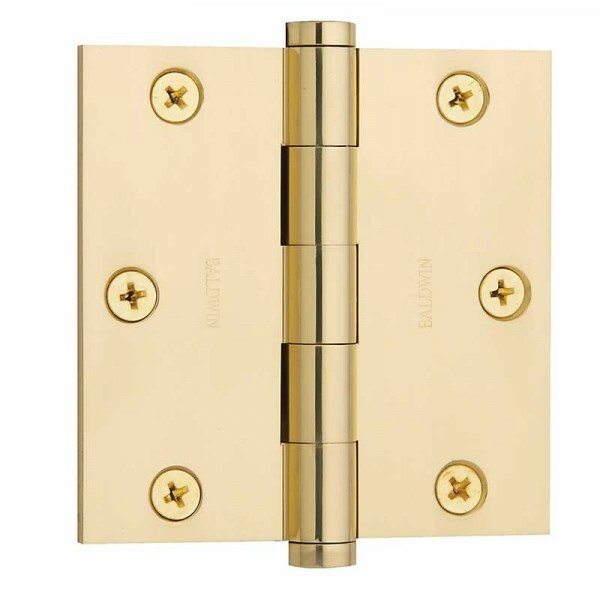 Extruded brass, full mortise hinges are machined for precise installation and smooth movement. Knuckles are milled to a clearance of 0.010˝ (.25mm) to minimize vertical wear. Each hinge is beveled on the inside leaf to obtain a tight fit when viewing the hinge in a closed position, and furnished with stainless steel, rust-proof pins for added durability. Each pin is manufactured from precision ground Type 302, stainless steel material to prevent corrosion. The pin “floats” within the barrel of the hinge, yet is held in a stationary position. Pins can be removed by unthreading each finial and tapping the pin upward from the bottom of the barrel. Hinge finials are specially designed to thread into the top and bottom of the hinge barrel, preventing the pin from rising out of the hinge barrel. Hinges are furnished standard with button design finials. All full mortise hinges are supplied standard with appropriate size wood. The screws are fully threaded to the head and have an undercut head for secure installations. Hinges manufactured from solid brass extrusions have two inherent properties: exceptional strength and precision tolerances. Baldwin’s extruded hinges are machined from a solid brass bar to exact tolerances to ensure an even wear between each knuckle. 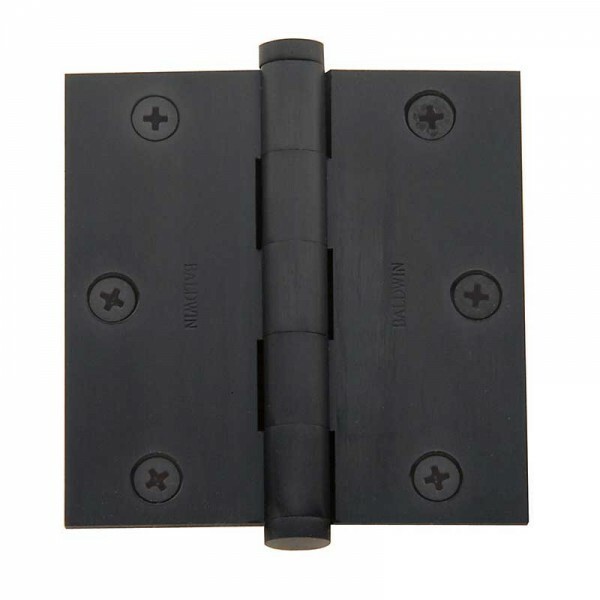 The result is a QUALITY hinge which can withstand above average door weights and stresses with maximum vertical and lateral wear performance. 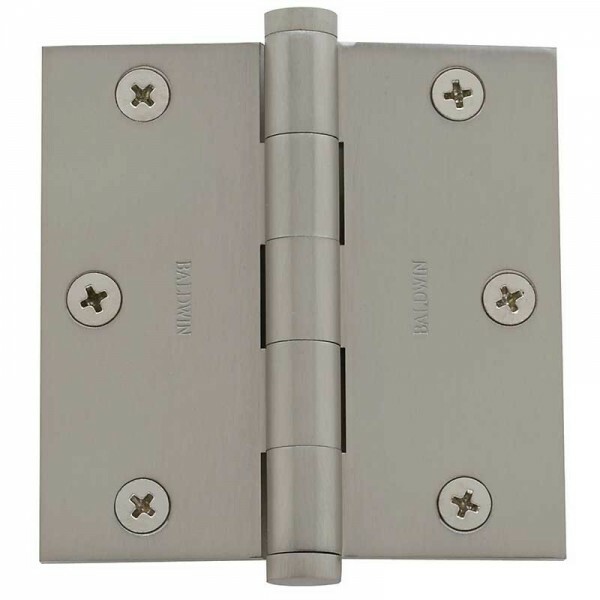 Baldwin full mortise hinges are classified as STANDARD WEIGHT for installation on doors up to 1.75˝ (44mm) in thickness. Use three hinges on doors up to and including 7.5 feet (2.3m) and one additional hinge for each additional 2.5 feet (.76m) or fraction thereof. Hinges can be obtained with non-removable pins to prevent removal of hinge pins when the door is in a closed position. This special application is used when the hinge barrel is exposed to the exterior side of a building (Reverse Bevel Door Conditions). A stainless steel set screw is inserted into the barrel from the inside of the hinge (Emblem Mark Side), which intercepts a groove milled on the pin. All hinges have a slight offset leaf which provides clearance of .062˝ (1.57mm) when leaves are closed and parallel. All hinges have template screw hole locations for use on either wood or hollow metal doors and frames.